IBM MQ is messaging middleware that simplifies and accelerates the integration of diverse applications and business data across multiple platforms. It uses message queues to facilitate the exchange of information, and offers a single messaging solution for cloud, mobile, the Internet of Things (IoT), and on-premises environments. The IBM MQ service on AWS supports client messaging applications from within your virtual private cloud (VPC), from trusted addresses on the internet, and via a VPN from your on-premises environment. This Quick Start deploys IBM MQ into a VPC in your AWS account. You can build a new VPC for IBM MQ, or deploy the software into your existing VPC. The deployment and configuration tasks are automated by AWS CloudFormation templates that you can customize during launch. In a private subnet, an IBM MQ server in an Auto Scaling group of 1. Amazon Elastic File System (Amazon EFS) automatically mounted on the IBM MQ server instance for distributed storage, to ensure high availability of the queue manager service and the message data. If the IBM MQ server fails in one Availability Zone, a new server is created in the second Availability Zone and connected to the existing data so no persistent messages are lost. 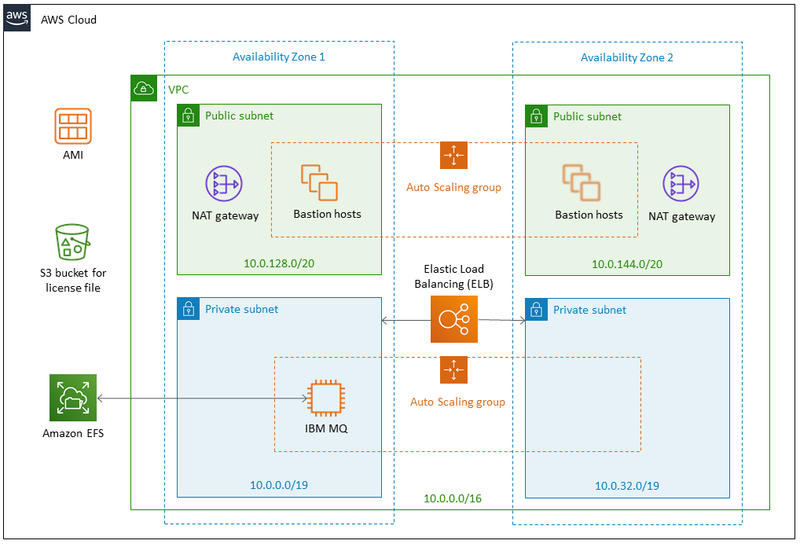 Elastic Load Balancing to automatically distribute connections to the active IBM MQ server. Appropriate security groups for each instance or function to restrict access to only necessary protocols and ports. For example, access to HTTP server ports on Amazon Elastic Compute Cloud (Amazon EC2) servers is limited to Elastic Load Balancing. Connect to IBM MQ through a web console to verify the deployment. Connect to the IBM MQ server instance through the bastion host instance in your VPC. During deployment, you can configure AWS infrastructure components, IBM MQ instance settings, and IBM MQ administration credentials. This Quick Start requires a license for IBM MQ. To use the Quick Start in your production environment, sign up for an IBM MQ program license at IBM developerWorks (requires an IBMid). You’ll need to place the license key in an S3 bucket and specify its location when you launch the Quick Start. If you don’t have a license file, the Quick Start will deploy an IBM MQ trial license, which allows 90 days of free usage in a non-production environment. After this time, the queue manager will expire. You can purchase support at an additional cost, or use the forums. If the license file is in place at stack creation time, the IBM MQ server will automatically use the production license. To upgrade from a trial license to a production license after deployment, follow the instructions in the IBM Knowledge Center. For more information about licensing terms, see the IBM MQ software license agreement.